PITTSBURGH (AP) — James Conner isn’t much on talking. Not about the cancer battle that threatened to sidetrack his promising career before he even reached the NFL. Not about his ongoing audition as the new featured running back for the Pittsburgh Steelers while Le’Veon Bell continues his extended sabbatical. Not even about his new role as an obstetrician in shoulder pads, a side gig he picked up while helping teammate JuJu Smith-Schuster celebrate a touchdown during Pittsburgh’s one-sided 41-17 victory over Atlanta on Sunday. Smith-Schuster feigned contractions while lying on the Heinz Field turf before Conner took the ball and placed it in the wide receiver’s hands. Considering how Conner looked while piling up 185 total yards and two touchdowns as the Steelers (2-2-1) restored some sanity to their uneven season, that’s probably a good idea. Running often and with authority — two traits that defined his record-setting college career at Pittsburgh — Conner served as the offensive fulcrum Pittsburgh turned on while punishing the reeling Falcons (1-4). Particularly after the way Pittsburgh looked in the second half of a loss to Baltimore the previous week, when the Steelers basically abandoned the idea of giving the ball to Conner entirely, even though the game was tied at the break. There was no such wavering this time. Conner had 99 total yards in the first quarter alone, including a 30-yard catch-and-run, and kept right on going. He ran for 110 yards on 21 carries and added 75 yards receiving. It was a performance that was reminiscent of the kind Bell has churned out with regularity before deciding to spend the first portion of this season staying away while waiting to sign his one-year franchise tender. Though Conner understands the desire to stack his play up against Bell’s, he wants no part of it. He’s just doing what he’s asked to do. Against Atlanta it was give the offense some much-needed balance. The Steelers ran the ball 29 times and passed it 29 times while improving to 7-0-1 all-time at home versus the Falcons. The kind Conner and his teammates hope is repeatable. 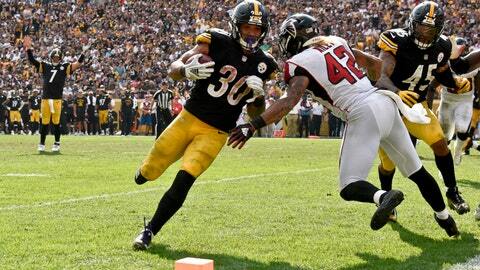 Some other takeaways as Pittsburgh sent Atlanta to its third straight loss. The Falcons are off to their worst start since 2013. While injuries on defense have played a significant factor, one of the main issues in Pittsburgh was an offensive line that couldn’t protect Matt Ryan. The Steelers chased Ryan down six times, including a strip-sack by T.J. Watt with less than 4 minutes to go that ended with teammate LJ Fort falling on the ball in the end zone for a touchdown. Roethlisberger and Steelers wide receiver Antonio Brown rediscovered the chemistry that’s made them one of the most potent combinations in the NFL for the last five-plus years. Brown caught six passes for 101 yards and two touchdowns and downplayed the notion there’s been any sort of communication problem with his longtime teammate. Pittsburgh kicker Chris Boswell missed his third extra point of the season, matching his career total coming into 2018, but the Steelers also produced a bright spot on special teams when Nix broke in and blocked a punt by Atlanta’s Matt Bosher that set up Conner’s second touchdown run. Falcons: Welcome NFC South rival Tampa Bay next Sunday. The teams have split their last six meetings. Steelers: Visit AFC North-leading Cincinnati (4-1) next Sunday. Pittsburgh has won 9 of 10 against the Bengals.